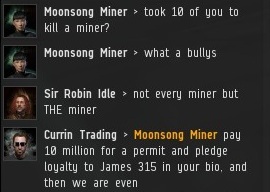 Previously, on MinerBumping... After challenging the New Order to gank her tanked-up Mackinaw, Moonsong Miner was ambushed in Brapelille and podded out of the system. Moonsong made the trek back to the system, from wherever she had been podded. 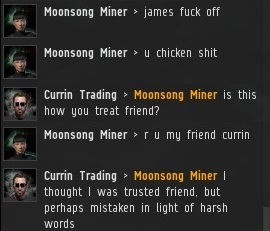 The winners of the fight offered a "gf" in local, but Moonsong did not reciprocate. 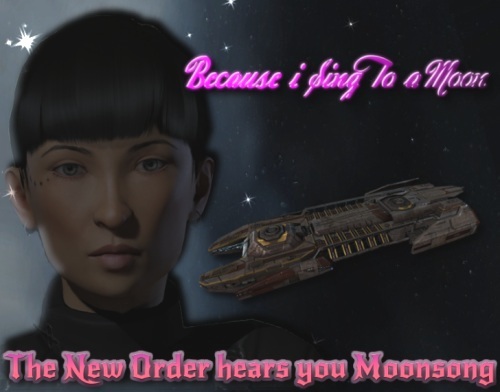 Once again, Moonsong was offered a chance to join the New Order family. Moonsong was still a bit miffed about the loss of her Mackinaw. She could not be persuaded to join up. 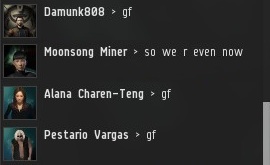 Then she dropped a bomb: She would move out to lowsec, rather than obey the rules of highsec. Incredibly, the attack on Moonsong's ship only served to drive a wedge between the miner and the New Order. Could the damage be repaired? 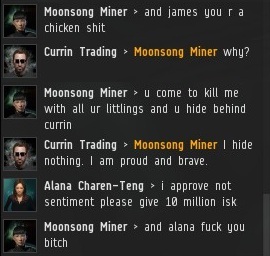 Moonsong Miner disappeared from the scene. Later, Moonsong's alt, Jajudo Song, appeared in Brapelille to deliver a message. Rebel Szlam, paranoid as ever, suspected Moonsong of being a deep-cover operative. Not so. 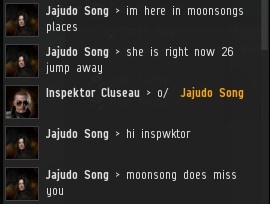 Jajudo reported that Moonsong had moved to lowsec to mine outside the jurisdiction of the New Order. Agents present in the system offered their goodbyes to Moonsong. Doctor Christopher Hansen made a painting to celebrate the life and times of Moonsong Miner. Whether or not we'll see her again, no one knows. But they say if you listen hard at night, when the moon is full and bright, you might just hear a few bars of Moonsong's moon song. That's beautiful. Glory to the Code. Victory for the Order. 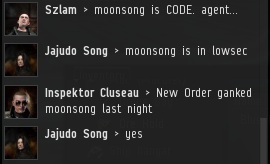 If it's is true that Moonsong has moved herself to losec as a result of the CODE., where she will need to interact with other players each and every time she undocks, she may be one of the greatest victories the New Order has won in it's campaign against a section of the playerbase who feel EVE can be played as a single player game. 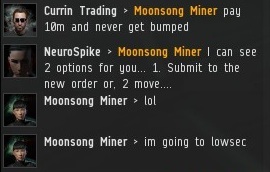 I wish Moonsong the best of luck out there amongst the losec stars, which surely shine brighter than those of hisec. I can't believe it, I'm hard. Im gonna miss those bangs.